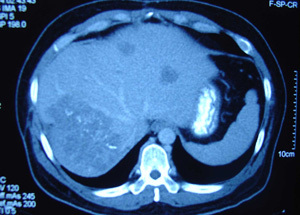 CT Scan Report: 3 October 2008: There is ill-defined hypodense lesion at Segment VI. It measures 3.5 x 3.5 cm. Feature is suggestive of right lobe hepatoma. 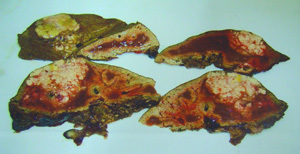 Histology Report: 7 October 2008: Liver tissue weighing 350 gm, measuring 140 x 120 x 60 mm. Diagnosis: hepatocellular carcinoma. Worsening of the liver with increase in the number and size of the liver nodules. 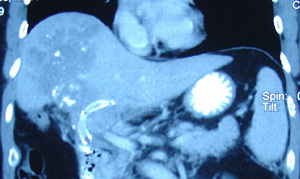 There was thrombosis of the adjacent portal vein extending partially to the main portal vein. He felt tired when walking or even talking. His ear started to produce a humming sound throughout the day. This is a very tragic story indeed. Professor Jane Plant wrote: Conventional cancer treatment can process patients to the extent that they no longer understand what is really being done to them. It started with a threat or instill of fear in patients. Your liver is rotten – if you don’t get it out it is going to kill you. And you must do it fast! And look what has become of Sam now? Dr. Richard Fleming (in Stop inflammation now) wrote: … all forms of surgery cannot provide a long-term cure because they do not deal with the underlying cause of the disease, which is inflammation … Surgery often triggers an even greater inflammatory process, which encourages the illness. Sam handed us the reading of his alpha-fetoprotein (AFP) below. When Sam tried to seek clarification with the surgeon, he was snubbed. The surgeon did not even want to talk to Sam and his wife. Sadly, patients like Sam were left in a limbo. Sam was then passed on to another doctor. Patients on placebo (sugar pill) – median survival = 7.9 months. Nexavar only increased survival by 2.8 months. No where in the website does it ever say Nexavar cures liver cancer. If ever there is anything we can learn from this story, it is this: Ignorance can kill. For years, we at CA Care, have been trying to empower patients by providing them with knowledge. However, patients are not interested to read or find things out for themselves. Far too often, patients prefer to find an easy way out and remain ignorant. And then when they reach this desperate end stage they would say to us: Oh, but we do not know all these. We trust the doctors. Note: In mid-April 2009, we were informed that Sam died. Sam was operated on in October 2008 and by April 2009 he was dead. That was just six months after surgery. What do you think has hastened his death? Was it the surgery or his cancer? What could have happened if Sam did not do anything? Could he have lived much longer (minus the hefty hospital bills)? 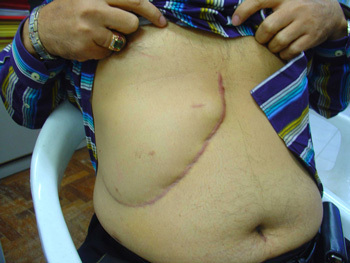 This entry was posted in Failure Story, Liver Cancer and tagged liver cancer, recurrence, surgery by CA Care. Bookmark the permalink.